There are a number of videos available that demonstrate thin layer chromatography – we figured it might be helpful to put some of these here as an easy reference. NOTE: we were not involved with the production of any of these videos, we want to make sure you give credit where credit is due – so we’ve included any information we can from the individuals and organizations responsible for these productions. Also, these videos are offered in no particular order. Please feel free to send along any videos to add to the collection. 1. O-Chem Thin Layer Chromatography with Dr. John Davison at Irvine Valley College, in Irvine, Ca. (Part 6 of 7) of the IVC Chemistry Lab Safety Series. 5. Thin-layer Chromatography is used to separate the components of a drug mixture by polarity on a thin plate. 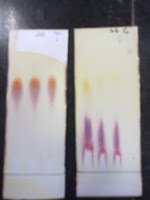 This entry was posted in Thin Layer Chromatography, TLC Videos on August 8, 2012 by Steven Miles. Uncovering new fats, or lipids, with links to diseases in the human eye is as easy as taking a lunch break, according to UOW chemists from the ARC Centre of Excellence for Free Radical Chemistry and Biotechnology. The research, conducted by UOW Associate Professor Stephen Blanksby and his PhD student Shane Ellis, used ozone naturally present in laboratory air to find previously unknown lipids in the human lens. Their work was featured as a hot article in a recent edition of the scientific journal, Analyst. “My lunch breaks are never unproductive,” according to Shane. Using a combination of two methods called desorption electrospray ionisation mass spectrometry (DESI) and thin layer chromatography (TLC) that the group combined specifically for these experiments, lipids can be characterised in one simple analysis, a significant improvement on older methods. We tip our hats to Professor Blanksby and Mr. Ellis. This entry was posted in lipids, Thin Layer Chromatography on April 12, 2012 by Steven Miles.